Please click anywhere to go to our blog, and follow us! Sphynx Cat World | the greatest show on earth! Welcome to the greatest show on earth! Naked cats, furry humans and fashion for felines, fido’s and folks alike! Answers to your most unusual questions, solutions for the most unique problems. Wonderful!!! Another place to go for such a beloved breed!!!! The incredible Sphynx!!! 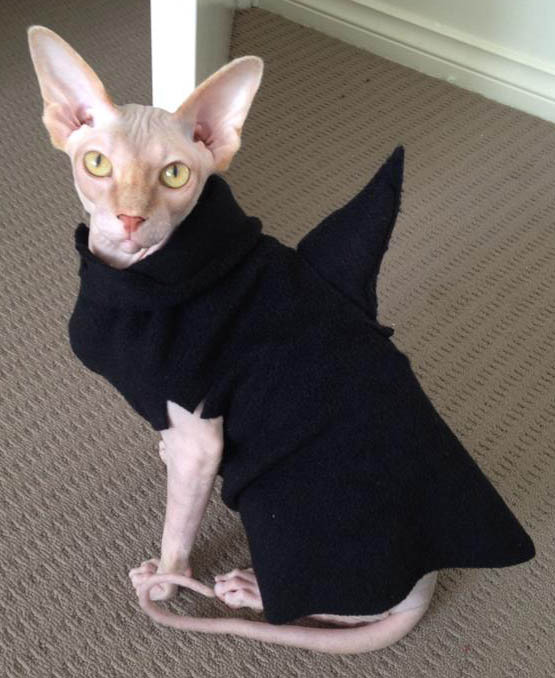 Dressing your Sphynx Cat can Save you Money and Time. Fashion 4ward – Will Feature our new “Belle of the Bald” Tutu in Pink Filigree! We’re a sucker for a sphynx in a tutu. Stella Oriens for Simply Sphynx “Belle of the Bald Tutu” in pink filigree. Ms. Jovie Monroe, who owns Stylist Beth Sullivan, models the pink SHARK! Ori is putting on his best with a real mens shirt” collar” and a pink satin bow tie to match the tutu. Customized Twenty Twelve Theme. Blog at WordPress.com.